A parliamentary report of 1777 recorded a parish workhouse in operation at Wilton for up to 80 inmates. County of Wiltshire: Barford St Martin's, Baverstock, Berwick St James, Bishopstone, Bower Chalke, Broad Chalke, Burcombe, Compton Chamberlayne, Dinton, Ebbesbourne Wake, Fifield Bavant, Fisherton de la Mere, Fovant, Fugglestone St Peter, Little Langford, Steeple Langford, Netherhampton, South Newton, Stapleford, Wilton (3), Great Wisford [Wishford], Wylve. Later Additions: Bemerton (from 1894), Groveley Wood. The population falling within the Union at the 1831 census had been 10,270 with parishes ranging in size from from Little Langford (population 39) to Wilton itself (1,997). The average annual poor-rate expenditure for the period 1833-35 had been £8,811 or 17s.2d. per head of the population. 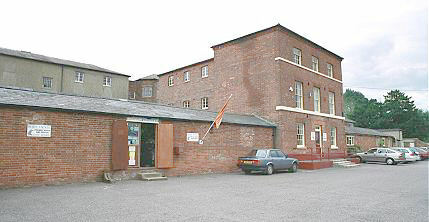 Wilton Union workhouse was erected in 1836-7 at a site to the north of Wilton. The Poor Law Commissioners authorised an expenditure of £5,720 on construction of the building which was to accommodate 280 inmates. It was designed by Edward Hunt, who was also the architect of the Alderbury and Alresford Union workhouses. His design for Wilton was based on the Commissioners' model cruciform or "square" plan published in 1835. The workhouse location and layout are shown on the 1925 OS map by which time it had become known as Kingsway House Poor Law Institution. It included an entrance and administration block behind which further accommodation ranges radiated from a central octagonal hub to create separate exercise yards for the different classes of inmate (infirm/able-bodied, male/female). Wilton from the south-west, 2000. Wilton from the north-west, 2000. 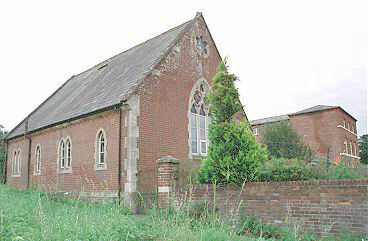 Wilton from the south-east, 2000. A chapel was later added at the north of the site. Wilton chapel from the north-west, 2000. Sometime after the passing of the 1913 Mental Defectives Act, the workhouse was converted for the accommodation of 'mental defectives'. A 1936 map describes it as being a home for female mental defectives. The storage and removal company Moody's took over the site in the late 1930s and were there for almost seventy years apart from a period of military use during the Second World War. In 2007-8, a housing association converted the building into 31 low-cost homes. Wiltshire and Swindon Archives, Wiltshire and Swindon History Centre, Cocklebury Road, Chippenham SN15 3QN. Very few records survive. Holdings include Guardians' minutes (1835-1930, with gaps).